Got a Kindle Fire HD? I do, and if you're like me you're probably rather annoyed at having been stuck with ads on the home screen, more ads on the lock screen, and even more ads on the home screen. You may even have gone so far as to pay Amazon's danegeld to get rid of the ads. If so then I have some good news for you. According to Gizmodo the next update for the KFHD will give you the option of removing the last bit of ads from the home screen of the tablet. Update: A different source is reporting that Amazon will let you remove the recommendations without paying the fee. Scroll down for Amazon's statement at the end of the post. I'm talking about the recommendations bar, where Amazon pitches related content they want to sell you. While it might not be obvious to everyone, that section of the home screen is actually advertising. Speaking as someone who doesn't like being pitched constantly, getting rid of that ad space is going to be quite nice. Or at least it would be nice, except that the ads don't bother me at the moment. You see, I found a way to not look at the ads and still not pay the fee to get rid of them, and it is a fairly simple trick. I don't access any of Amazon's content from the home screen. Sure, I have apps, ebooks, and other content that I've bought from Amazon, but I only access them from the various sub menus. The only stuff i access from the home screen carousel are 3rd party apps and content. Amazon doesn't know what to recommend to go along with those apps so instead they leave the space blank. I love that. While I might not be able to use the full screen real estate the way I want, I can at least use the KFHD in peace. Speaking of ads, the ones on the lock screen don't bother me as much as they used to. There's only a handful of different ad options, and thanks to the limited selection I have been able to tune them out. I don't even see the ads anymore; I'm happily oblivious to their presence. We wanted to let you know that in the coming weeks, free software updates will be coming to Kindle Fire HD and the latest generation Kindle Fire. These software updates will include Kindle FreeTime, a tablet experience just for kids allowing parents to set daily screen time limits, and give access to appropriate content for each child. We're also adding a setting to let customers control whether or not personalized recommendations appear below the carousel on the device homepage. In addition, customers will be able to set their device default language to one of six languages, including English (US), English (UK), German, French, Italian, and Spanish. 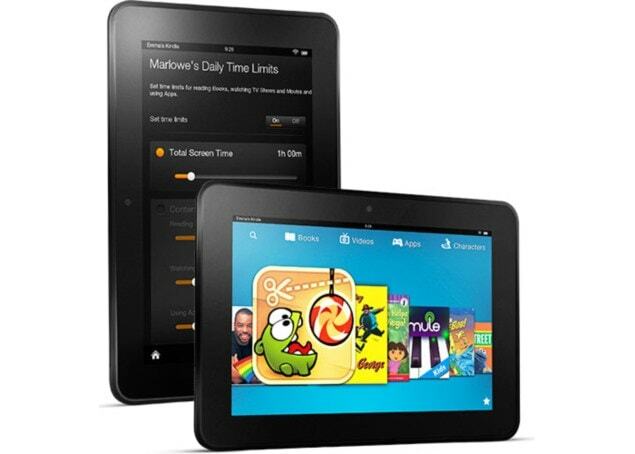 These updates will be delivered automatically to your Kindle Fire.